Every since Halloween and every time it’s dark Layla will go ‘whooooooo Halloween’. You can turn the lights out, or just go outside when it’s dark, when we go into the garage and haven’t turned the lights on yet, or she will turn the lights out in our internal bathroom after she’s gone a pond potty and ‘whoooooo Halloween!’ We haven’t corrected her yet as it makes us laugh. 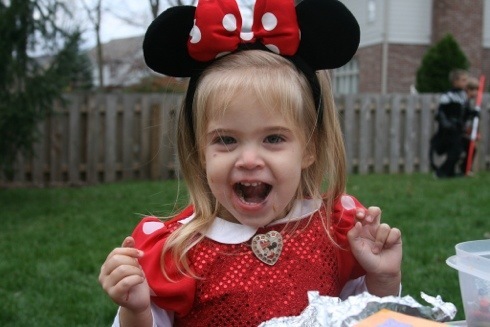 Hayden really enjoyed Halloween this year. Our neighborhood has a little party before trick-or-treating, and based on his reaction to that we weren’t sure he was going to be on board with Halloween yet. We took him to the party in his wagon, and he threw a fit whenever we tried to get him out of it once we got there (the kid loves his wagon). Actually, he would get out of it ok but he just wanted to pull the wagon around which wasn’t working since you can’t really participate in the party if you’re off on the sidelines pulling the wagon around. Eventually John was able to coax him to the party with a mixture of distraction and food. Hayden loves Lightning McQueen from the movie Cars, and I found an actual Lightning McQueen costume at Target that was adorable. His costume was a hit as lots of kids love that movie and even if you’ve never heard of it, how can you not think a toddler with a car costume jutting in front and behind him isn’t hilarious?! After the party it was time for trick-or-treating with our neighbor friends. He was good about saying “tck-ohl-teet” and “thank you,” as long as we prompted him every time. He came home with his bucket overflowing with candy – it’s going to take a long time to get through that! 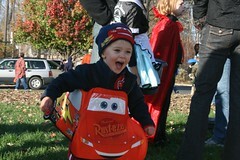 Hayden went trick or treating last week. He managed to come back with one bag of crisps, two chocolate bars. He is very talented. He slept through most of it though!! As I mentioned in a previous post, I went back to work this week. It was not AS bad as I had feared, but I still much prefer being home with Hayden! Tues was the most difficult day for Hayden; Wed was pretty good. I have decided that unless I have a meeting before he naturally gets up in the morning, I will just wait for him to wake up before I take him to day care. So Tues he woke up about 8:30 and Wed it was about 9:30. I had been working since about 7:30, so it was an hour or two into my work day before he left home which was nice. He’s not eating particularly well at day care and really not sleeping either, so I hope those things will straighten themselves out. Tues I guess he only ate about an ounce at both feedings. He ate well when I fed him at lunchtime and fell asleep, but he must not have stayed asleep as he really only got about 10 minutes the whole day they said. The worse thing about Tues though was when I went to get him he was in a bouncy chair crying and no one seemed to be doing anything. When I walked in they said he had only just started crying, so hopefully that was true. He didn’t seem all worked up or anything so I’m sure it was. But Wed he didn’t go in until about 10, after I had gotten him changed and fed and played with him a little. Then I had meetings until 1 so I called afterwards to see if he’d eaten ok or if I needed to come feed him, and he had taken a couple of ounces and was ok so I didn’t go at lunch that day because I was going to pick him up early for Halloween so wanted to work through lunch if possible. And I guess at his last feeding he’d had about 3 1/2 oz, which was by far the most he’d had there all week. Doubtless there are to be some adjustments to day care life for him, so I’m sure his eating and sleeping will get better. Halloween was fun. Hayden was a tiger. His costume had a little tail and everything. Very cute! Even Lucy and Abbey got in on the fun. Lucy was snow white, and might I say the prettiest snow white I have ever seen! And Abbey was a rooster for a very short time. 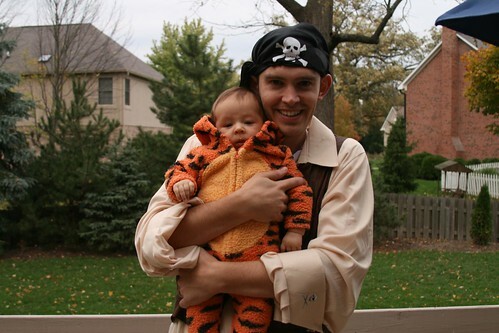 John took Hayden arou nd during trick or treating with our neighbor Brian. Our house sits at the entrance of the neighborhood, and there is only one other house besides ours which sits outside a neighborhood intersection that makes up the southern boundary of most of the trick or treating routes, apparently. We got very few trick or treaters, in fact almost all of them were families that we are friends with who made a point to come by. So Lucy and I went over to Macy’s and sat on the porch with Paula and Macy and handed out our candy there. We got to see a lot more people that way. But Paula said it was really dead this year compared to other years. That’s strange because there are loads of kids in our neighborhood and it was fairly warm for the time of year. We had fun anyway. Hayden has the ability now to do two things at once. One of these two things tends to be pooping or farting, but he can smile, hip-cup or cough all at the same time as filling up his nappy. I am obviously incredibly proud of his new skill. The other big change in Hayden recently is that he will start to follow you with his eyes. Up to now he has been randomly looking around, often just staring into space, but now i can walk into the room and he’ll see me and start to follow me around. That’s pretty simple, but also pretty cool. He loves water. He’s started splashing lots now, and he smiles and thinks it’s funny. Can’t wait for next year when I can get him into the pool. Hayden is preparing for his first Halloween. Halloween is a big deal over here so it starts basically at the beginning of Oct and continues throughout. Me and Hayden are going out trick or treating on Wednesday so I’ll update after that!